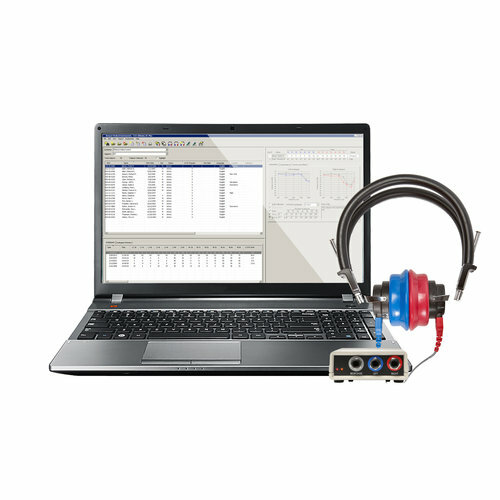 Bring the power of the latest in intelligent automation to your audiometric testing. There is no more comprehensive system available. The Benson Medical Instruments CCA-200mini delivers extraordinary advantages over conventional audiometers. The innovative IntelliTesting feature understands Hearing Conservation testing. It seamlessly scans audiograms for test problems, and responds appropriately so you won't have to call back a test subject for retesting. Test instructions are delivered to the subject through the headset. The CCA-200mini stores unlimited subjects and tests. It produces full-page reports with data and analysis on standard paper rather than strip prints. The result is higher-quality tests, with less operator intervention, in less time. A CCA-200mini reduces test times 25 to 40%, installs with fewer cables, and is designed to mount in the test booth. Check out our Plus Package for comprehensive reporting, multiple companies, and network database access.